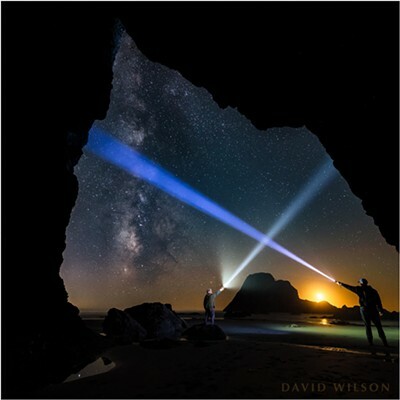 The Milky Way rises from the horizon near the glow of the setting crescent moon outside of this hidden Houda Beach cave. 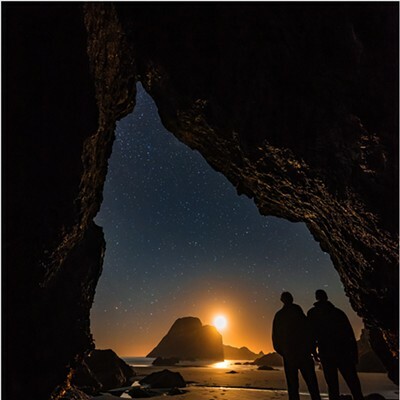 Camel Rock’s silhouette is large on the horizon beside the glow of the setting crescent moon. 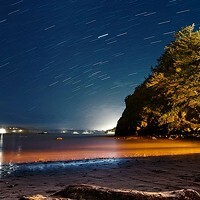 Humboldt County, California. September 13, 2018. 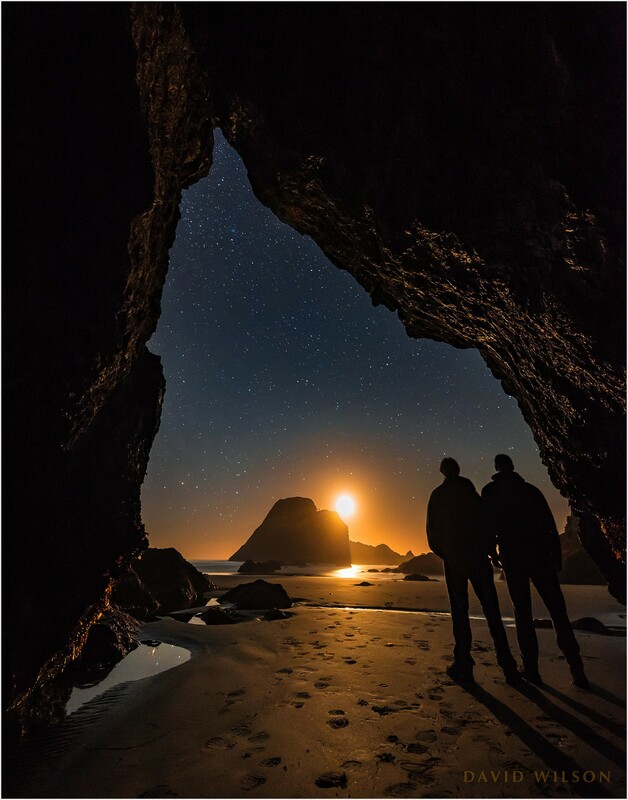 It was a low tide, a low moon, the cave and the Milky Way — long had I waited for this combination to come together. And when it did, somehow, I was there. All summer I’d watched the tides, waiting for a tide low enough for me to get to the cave safely sometime before midnight (hey, I get tired). But the idea had slipped from the forefront for a time and I hadn’t been watching the tides when the bug to go out hit me and I called my brother Seth for company on a photographic outing. Near the cave’s entrance, Mars peeks over the edge as two rocks frame the Milky Way. Checking the tide, I saw that it would be fairly low right after the crescent moon set. 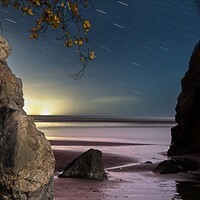 I decided on Houda Beach, anticipating that some interesting rocks would be exposed. I hadn’t realized that the tide would be low enough to reach the cave until we arrived, but it was. 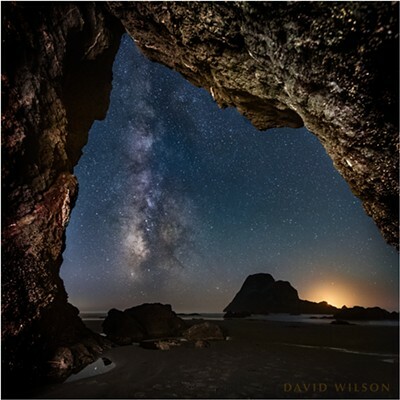 Not only that, the Milky Way was lined up outside of it, framed in the entrance, along with the silhouette of Camel Rock near the setting moon. I’d wanted this photo for months but only when I forgot to plan it did it come about. It’s interesting how that works. 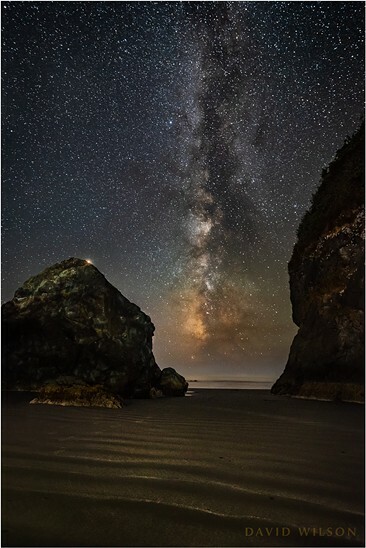 And I realized then that even if low tides had allowed me nighttime access to the cave during the summer months, the Milky Way would have been out of view to the left. It had to be this night. And I was there. I’m grateful for these opportunities. My brother and I watched the crescent moon set before taking the Milky Way photos. In gathering enough light to illuminate the interior and see the stars this well, the moon’s crescent shape became blown out in the highlights. 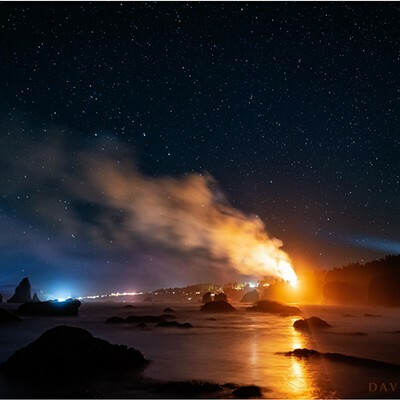 Leaving the cave, we were alerted by sirens behind us and turning found a large fire burning farther north up Scenic Drive, illuminating the entire area and throwing a great smoke plume across the waters. According to reports I read later, it was a vegetation fire. We watched the lights of first responders approaching it and it seemed to us by the diminished glow that they quickly had it under control. At one point while photographing, my brother and I played with our light beams beneath the cosmos, careful not to cross the streams. We tried one take on this, and by luck our beams formed a little house over the setting moon and Camel Rock. To keep abreast of David Wilson’s most current photography or peer into its past, follow him on Instagram at @david_wilson_mfx or his website mindscapefx.com, where you can also contact him, but which Wilson says he updates less frequently.